It may seem strange to some, but I enjoy wandering through cemeteries and looking at headstones. 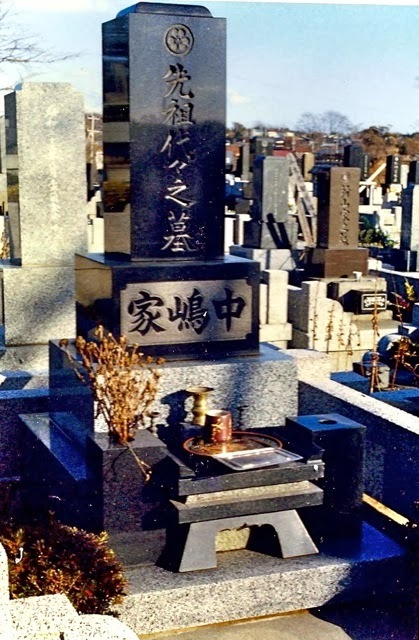 Japanese cemeteries are somewhat different from the ones in the United States. First, the headstones are extremely close together; secondly, most have a place for leaving offerings. Space is very limited, so most Japanese are cremated. The urns are usually placed in a sealed chamber somewhere near the large monument. The large headstones have the family name engraved and many family members can be inurned at this site. 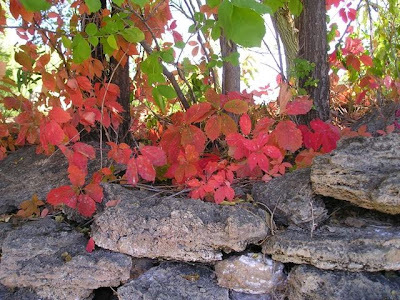 Individuals' names are usually carved on the sided of the topmost stone. This short video illustrates a typical visit to a family grave. Do you have a houseful of guests and need something to begin the flow of conversation? Check out Thanksgiving Trivia on The Mother Huddle. She provides an attractive print-out of question cards, an envelope in which to store them, and instructions. Looks like a fun activity for a large group gathered around the dinner table. Enjoy! 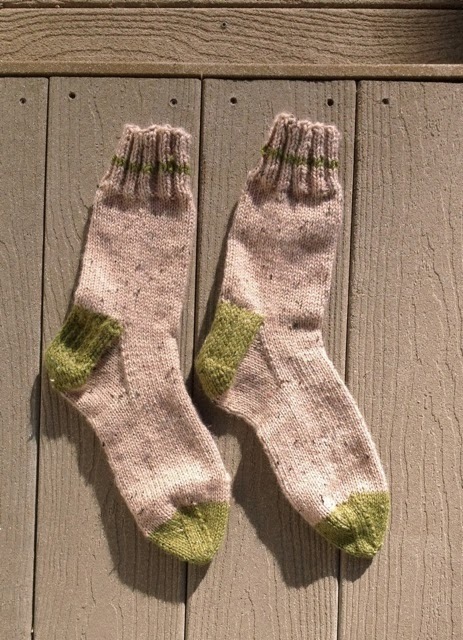 Same size and details as this pair of socks, only the colors are reversed. 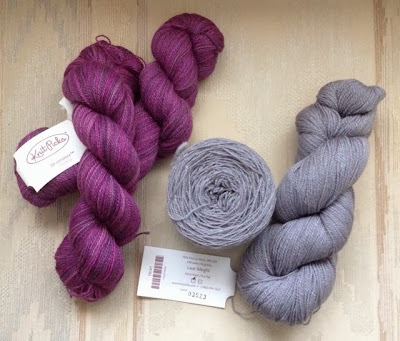 I don't need any more projects in the works, but the Advent Calendar Scarf KAL (Ravelry link) sounds like a lot of fun. When I found four hanks of Gloss Lace in two separate colorways in my sewing room, it seemed as though it was meant to be. 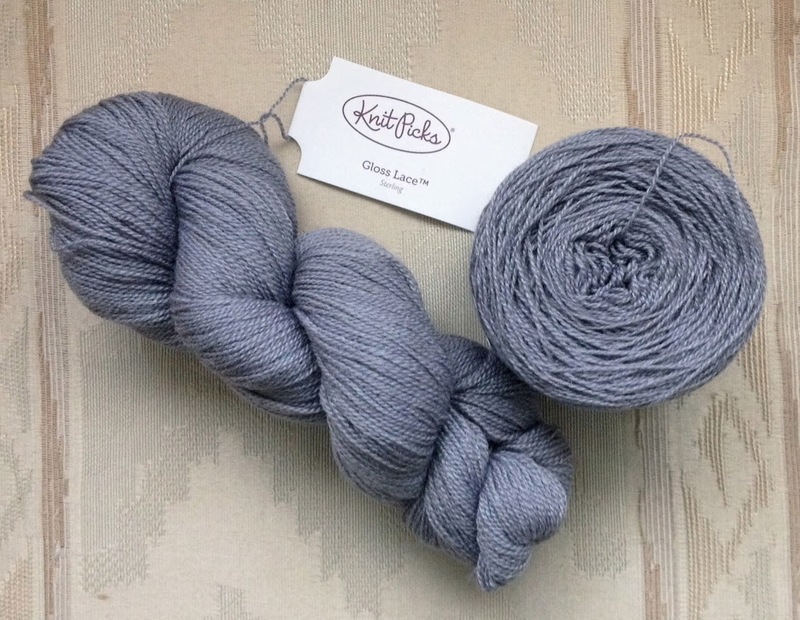 I chose the soft grey (Sterling) that has a hint of blue in low light. 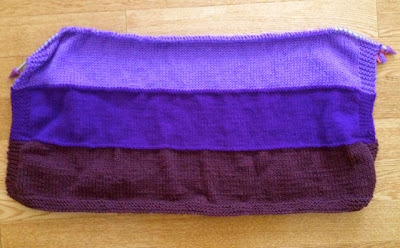 The finished scarf will look something like this. 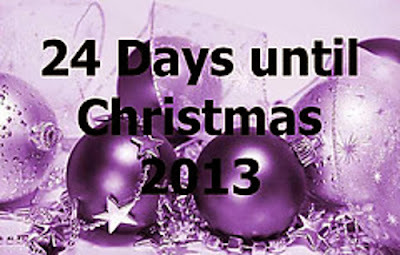 Daily, from December 1 - 24, the 2013 pattern will be posted here. 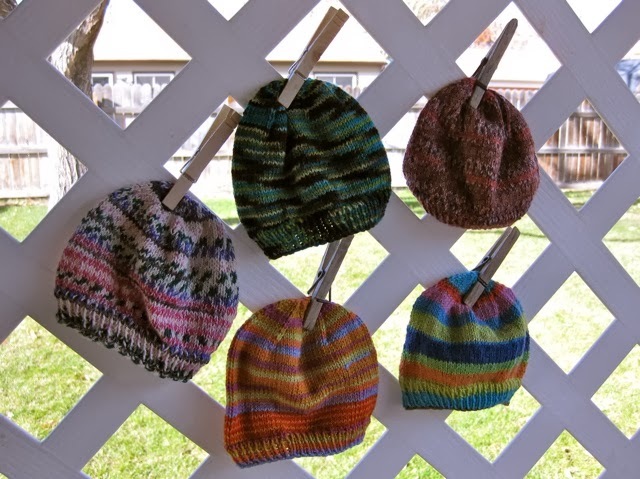 The Ravelry group (the first link given) will offer help and encouragement. Be forewarned the group is large (1,400 members, the last time I checked) and is VERY chatty. The original scarf is 50cm wide and 200cm long, which is nearly 20 inches wide and 78 inches long. Several on the Ravelry group mentioned knitting a narrow version, which is more realistic for me to knit and to actually use, so I'll be knitting the narrow scarf. I do not plan to use any beads although they do look great in the scarves that were finished last year. I have no plans of pushing myself to get the scarf finished by January, but it's my goal to finish by March 2014. The daily patterns are both charted and written and offered in German and English. Come on, you know you want to join this Knit A Long. . . Right? 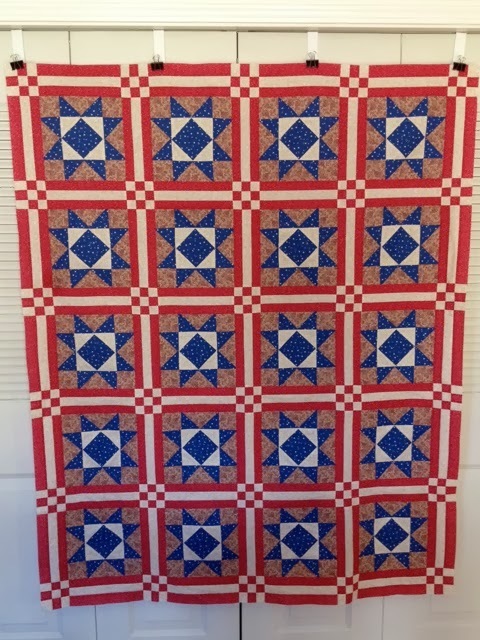 Stars of Valor is now a completed flimsy, and once I prepare the backing, it will be ready for a volunteer machine quilter to perform her/his magic. Most likely that will not happen until January because now everyone is busy with the holidays. My Quilt of Valor production was pathetic in 2013: I hope to make more than six in 2014 because the need is so great. 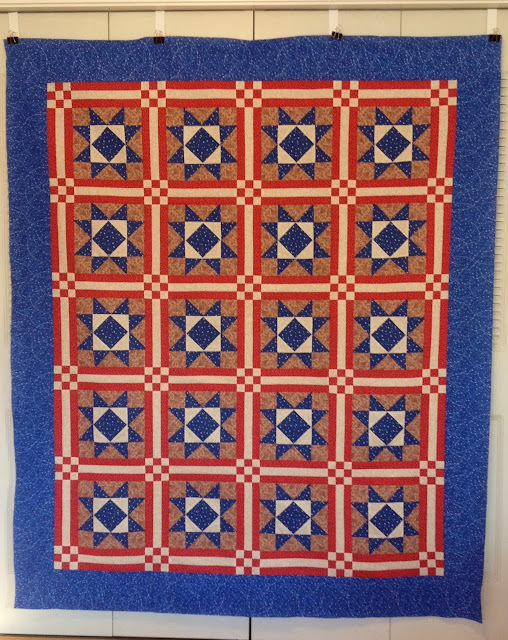 A list of my finished Quilts of Valor with links to individual quilts can be found here. Recently, Quilts of Valor were presented to some veterans in my community. You can read about it and see photos here. As of this afternoon, Stars of Valor is on its way to be quilted by Nancy in WA. Thank you, Nancy for your generous offer. Hokkaido is the upper island in the Japanese chain, and its culture is very different from the island of Honshu. The photo of above was taken when I visited Hokkaido for the Sapporo Snow Festival. Other photos taken on that trip can be seen here. 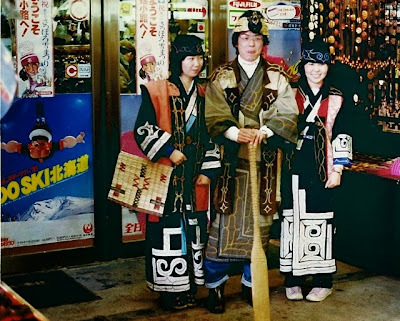 In my opinion, the traditional clothing worn in the typical tourist photo, shown above, has a distinct Alaskan air which begs the question - are the native Alaskans descendants of the Ainu, the Nivkh or the Orok people? I purchased the kit for this quilt in a silent auction at the local quilt guild's February show. Before I went to Denver in June, I cut the fabric for easy, chain piecing. I worked on the star blocks while Marilyn worked on one of her quilts. When she reached a stopping point on her project, she worked on the nine-patches for Stars of Valor's sashing. When I got home, this quilt project was put on hold. In July, I had company, so I didn't work on it. Then in August, I got caught up in a whirlwind of medical appointments, and the quilt marinated even more through September and October. Last week, I finally turned on my sewing machine and finished sewing the stars and sashing together. I need to add the final border (out of the blue fabric) before this is a completed quilt top. I hope to have this Quilt of Valor finished before the end of November. Many may think I am crazy, but I love to research: to me, it is like working on a puzzle, looking at all the pieces of information and discovering the one that fits perfectly. My niece is transcribing her paternal grandmother's diaries and wanted some items from old local newspapers that were mentioned. She emailed a list of dates, ranging from 1956 to 1990, with specific information/articles she wanted. I printed her list and headed to the library. 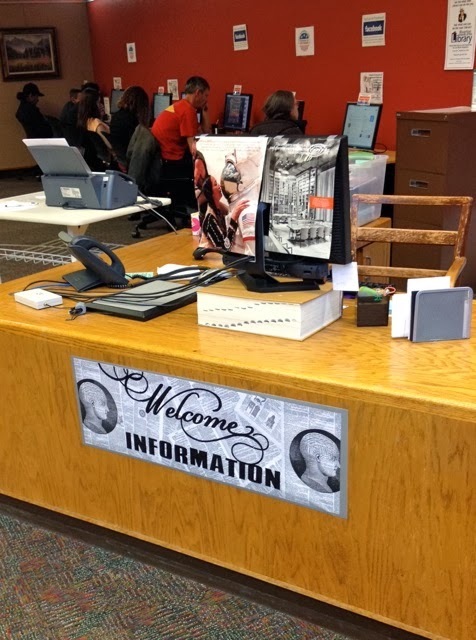 The library has the local paper on microfilm, so it was just a matter of getting the reel of film for a specific date, locating the item, printing it, and moving on to the next item. Sounds easy, right? I haven't used microfilm in years, but the process easily came back to me. 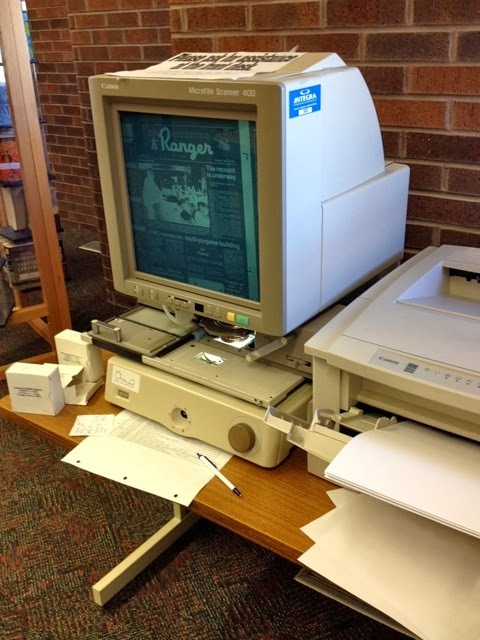 Anyone who has ever used microfilm and microfiche knows that "word search" is not possible. It takes patience and persistence. Speeding through the multiple pages, I came to appreciate internet and computer searches even more. I found the first item fairly quickly and pushed the "print" button on the microfilm reader and the page emerged from the printer. Oops, I didn't center it very well, so I adjusted the reader and pushed "print" again. Nothing happened, so I went to the check-out desk to ask for assistance. The woman came over and pushed the "print" button - nothing happened. She turned the printer "off" and then "on." Nothing happened. The woman who is an "expert" with the machine was not working that day. I texted my niece and asked if the print-outs were necessary and if I could take a photo of the screen with my cell phone. She said she was going to retype the articles anyway so a photo would be fine. Problem solved. In the end, old technology and new technology meshed for a successful research assignment. I love to tackle a good jigsaw puzzle and have worked on some difficult ones over the years. 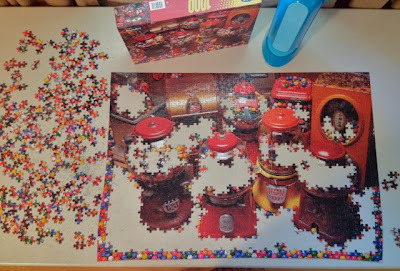 I thought I was up to the challenge this puzzle offered, but I was wrong: I called it quits when only the gum balls remained. This puzzle was the second (the first is shown here) in recent memory to cause me to cry, "uncle!" I am sure it will not be the last. Have you ever put a puzzle back in the box before it was completed? Something is amiss (especially in a library) when a perfectly-good dictionary is being used to elevate a computer monitor. I find this scene a disturbing collision of two worlds. It was customary for those living in the BOQs to have a maid, and Kiyoko (who worked for my good friend, Betty Moore) was mine. 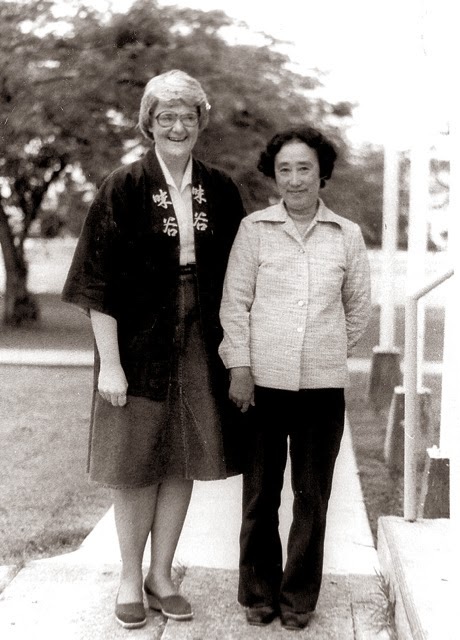 Kiyoko-san was a shy woman who did not speak English very well. Each week she cleaned my small apartment, did my laundry and ironed my clothes. Two months after Kiyoko-san started working for me, I came down with pneumonia: the base doctors told me to go home and stay in bed for a week. I don't think I have ever been so sick in my life: I was exhausted and slept a lot during that week. That week, Kiyoko brought soup for my evening meal, even on the days when she was not scheduled to work: she went above and beyond during my recuperation. One day, Kiyoko-san presented me with a note that I did not leave her enough work to do and asked if I would like her to make me some clothing. I purchased a sewing machine at the Base Exchange and fabric off base: I discovered that Kiyoko-san was an excellent seamstress. Kiyoko was surprised that I wanted to have my photo taken with her on the day that I left Japan. Kiyoko-san was truly a delightful and caring person. On a side note: I still have the Japanese, denim jacket (happi coat) I am wearing in the photo. These jackets were commonly worn by restaurant and sushi bar workers - a type of uniform. I purchased my happi coat at an on-base used clothing sale. Don't ask me what it says on the front. (I'm afraid to know.) This style of jacket is worn by workers in restaurants, sake houses, etc. The back of this jacket has a lovely logo with three fans forming a circle. I purchased another happi coat, several aprons, and kimono obis for souvenirs. 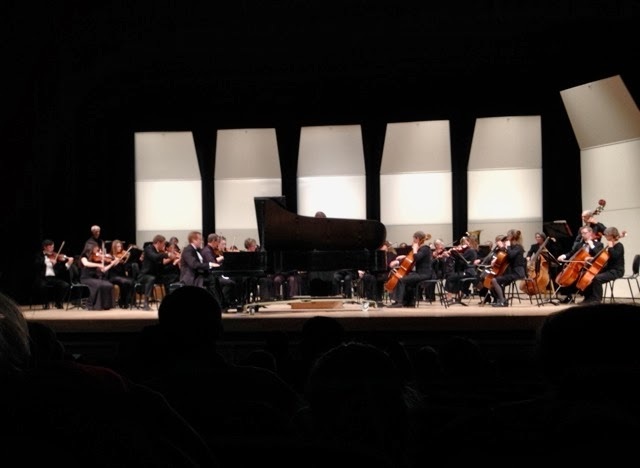 Last week I attended three concerts: California Guitar Trio - Montreal Guitar Trio performed for the Lander Community Concerts Association, Jackie and Gary performed mostly Gordon Lightfoot songs at the Riverton Public Library, and Fremont County Symphony with Richard Dowling, guest pianist performed in Lander. Three totally different venues and types of music, but three entertaining evenings. Have you been to any good performances recently? I toyed with the idea of canceling my cable television for a couple of years for several reasons: a) there aren't that many new shows that appeal to me anymore, b) I can watch my favorite shows on Hulu or Netflix for a fraction of the cost of cable, and c) the stations provided by the cable company are not of my choosing. Finally, I arranged to have my cable stopped on October 1st. 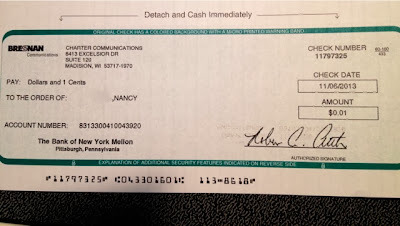 I got the refund check (shown above) in Saturday's mail. 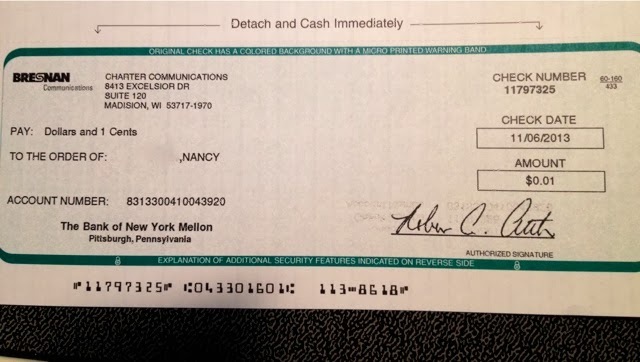 The cost of the paper, the postage, the time of the employee(s) to prepare the check total more than the actual refund. Do I miss having cable? Not at all. I can listen to NBC Nightly News podcast on my computer and/or phone (both audio or video are available) without commercial interruptions. I can listen to ABC news on my television via the Roku box and my internet. With the Roku, I can watch documentaries, movies and old TV shows on Neflix and other channels; I can also listen to all kinds of music. I love the variety, and I get to choose the channels (many are free). These thoughts were brought to you through the funding ($ .01) of Bresnan and Charter Communications. Sunday afternoon, I looked out my kitchen window and saw the unexpected -- colorful quilts draped over the pickets. Curious, I went out to investigate and met the woman (Barb) who lives behind me. The house has had several owners in the last 20 years and many of them clearly wanted to be left alone. Sunday, however, I discovered a quilter lives behind me. Draped over the fence were the Quilts of Valor Barb had made and planned to present tonight at a community gathering. 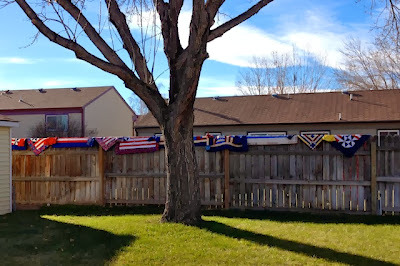 We visited through the fence about machine quilters in the community, the presentation, and the quilts that she and I had made for Quilts of Valor. I hope to visit with Barb another day without a fence between us because clearly we share a passion for quilts and Quilts of Valor. 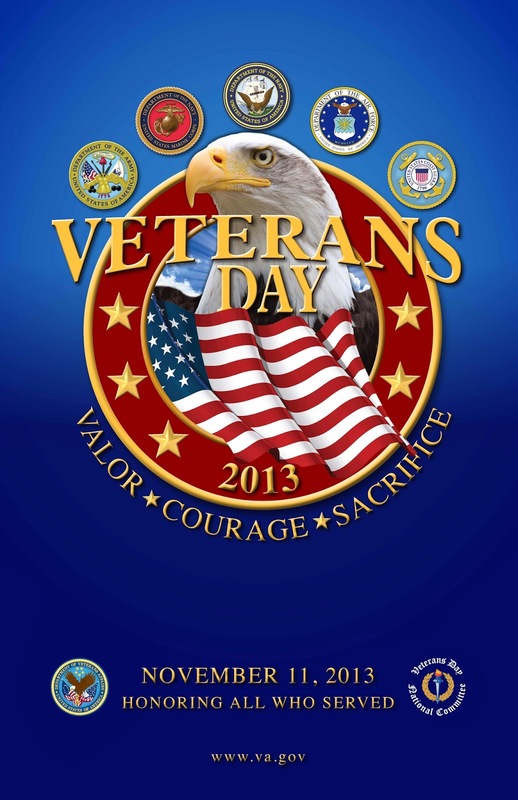 Thank You to all who have served and are currently serving in the military around the world. Because of these dedicated soldiers, citizens are able to take freedom for granted. 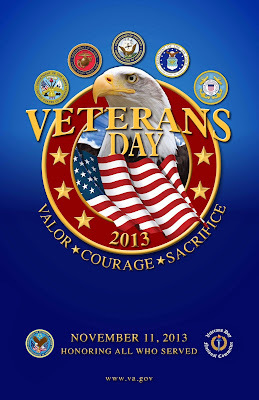 Today, please thank veterans and their family members for the peace of mind they selflessly provide(d). Check out the Veteran's History Project and search the database of interviews that have already been taken. The stories of more veterans need to be recorded. Do you know an organization that can spearhead this project in your community? 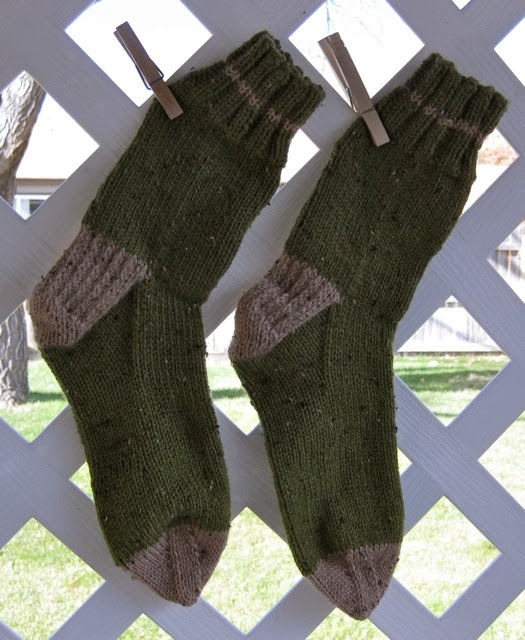 Update: I just read this blog post that contains a photo and a poem about knitting for soldiers. The poem was written in 1915 - amazing. I saw some unique and interesting advertisements in Japan. I can only guess what this billboard was promoting: security or a home. 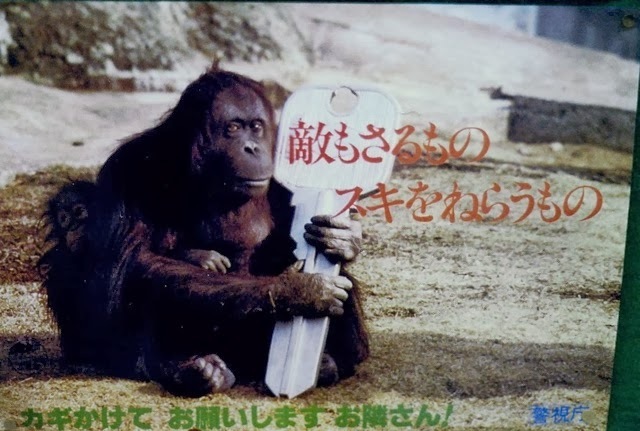 Perhaps, it is simply an advertisement for the zoo -- note the smaller animal sitting behind the larger one. What do you think is being promoted? This was the first time I've knit with this brand of yarn: it is very similar to Plymouth Encore. It is 78% acrylic, 20% wool, and 2% viscose and is machine washable. The recommended needle size is 7, but I wanted a tighter fabric for the socks. 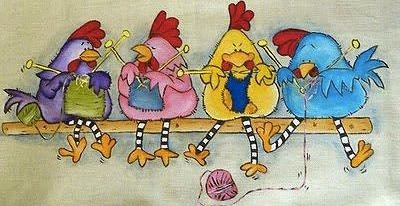 Have you ever noticed that some illustrators do not understand the concept of knitting? I have knit for nearly 50 years, and I have never seen a knitter holding needles like the woman in the Crankshaft cartoon. Have you? This misconception seems to be widespread. 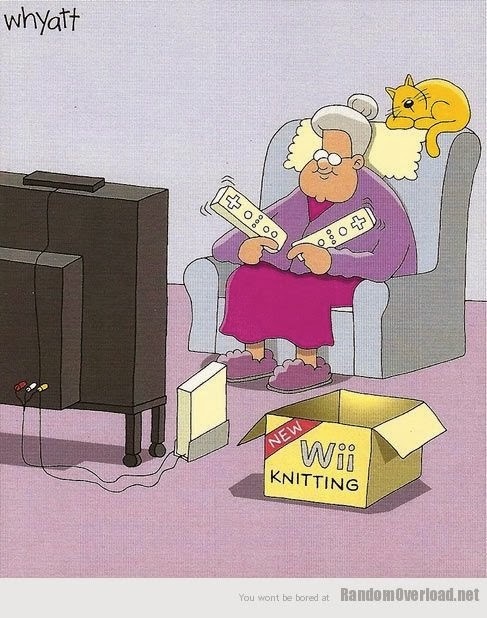 Possibly the needles are shown this way because if they were in the "normal" knitting position, it would not be clear that the individual was knitting. 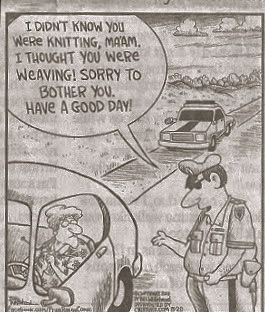 It's time for knitters to put an end to this misrepresentation. Let's knit in public as much as we possibly can. Together, we can end the confusion. 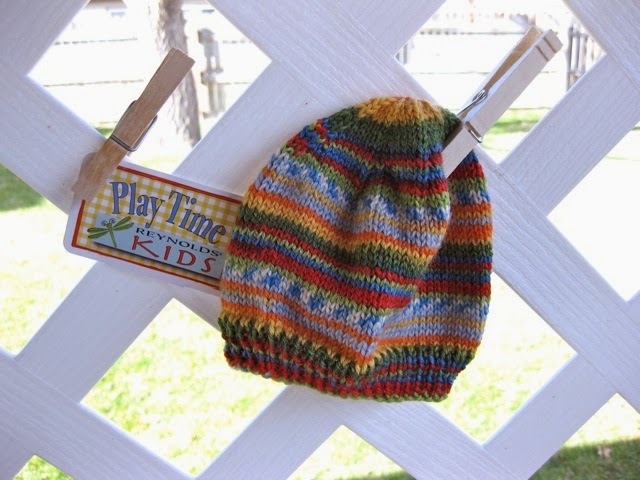 I found one more ball of Katheryn's scrap yarn, and turned it into a baby hat. The colors in this yarn are fun, and I love the stripes. Inspired by this hat, I decided to turn some of my scrap sock yarn into more baby hats. These little guys are addictive and what KathyB calls "potato chip" knitting - hard to stop after knitting just one, or two, or three, or . . .
Knit stockinette stitch until it measures four-inches from the cast-on edge. Row three and all odd rows: continuing decreasing as in row one, by knitting one less before the knit 2 together in each round. Final round: knit 2 together, cut yarn and thread yarn through live stitches to gather for the top. Weave in ends. These hats will be donated to a local charity. The knitter who started this Oddball blanket determined it would be knit with shades of purple using the stockinette stitch. The blanket was named in honor of Prince George of Chambridge. I used Caron Simply Soft (Grape) for my section. I stayed at the Sanno about six times in the two years I was in Misawa. The Sanno was managed by U.S. Navy and was located in downtown Tokyo. I stayed there while attending Overseas Education Association meetings. In the late 70s and early 80s, this hotel had seen better days, but it was clean and reasonably priced. Doing research for this post, I discovered this icon was replaced just three years after I left Japan. During the Vietnam War, the hotel was used by soldiers on leave. 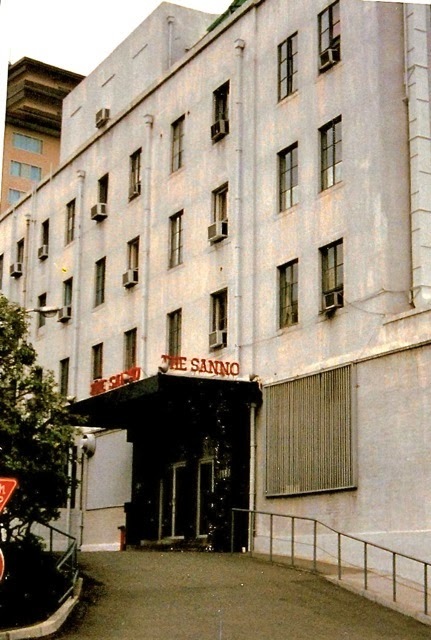 Over the years, the Sanno served as a literal crossroads of the Far East and a popular social meeting ground in downtown Tokyo for countless American personnel and dependents. Chances are one of your relatives stayed a night or two at The Sanno. Old age eventually took its toll on the building, and in 1982 The Sanno was closed. Its successor, The New Sanno (shown above) was opened in 1983 just two miles away. In 2000, the 44-story Sanno Park Tower was built on the land where the old Sanno Hotel once stood.